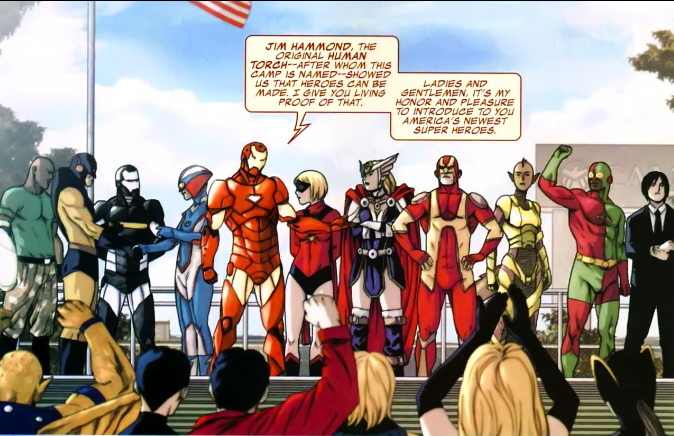 I know I’ve stopped reading Avengers for this blog, having read every single issue up through the Civil War, but I thought a good “post script” on my “Every Panel of the Avengers” series would be a note about Dan Slott and Christos Gage’s great series Avengers: Initiative. The book was underrated–written off my many, including me, as a fully dispensable book that existed solely to support the post-Civil War/Dark Reign period. That was a mistake. 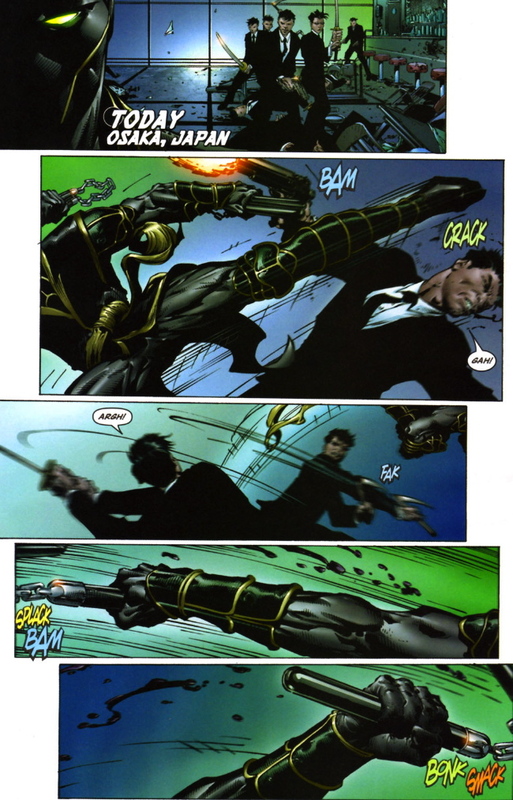 In fact, the book served as a great transition from Tony Stark to Harry Osborn’s periods as head of SHIELD. 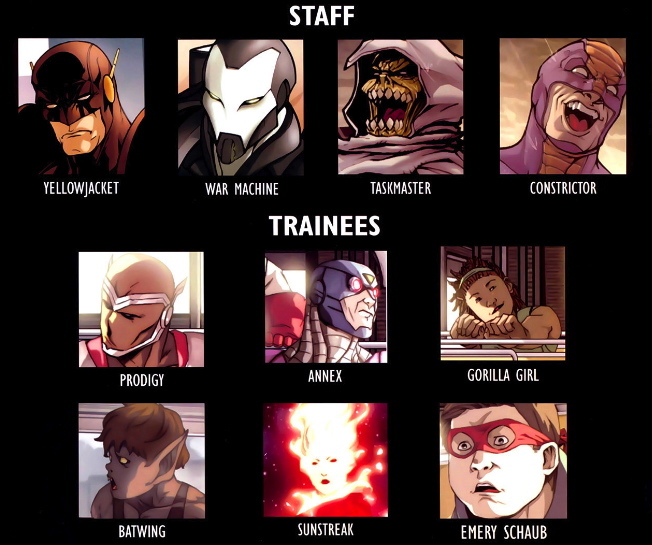 The book took a realistic approach to training superheroes, with paramilitary education formal basic training. 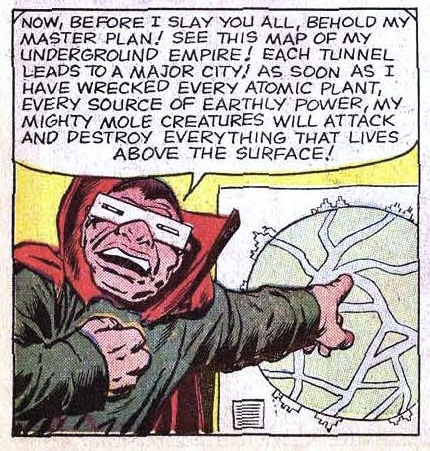 One wonders why The Avengers never did something like this sooner? 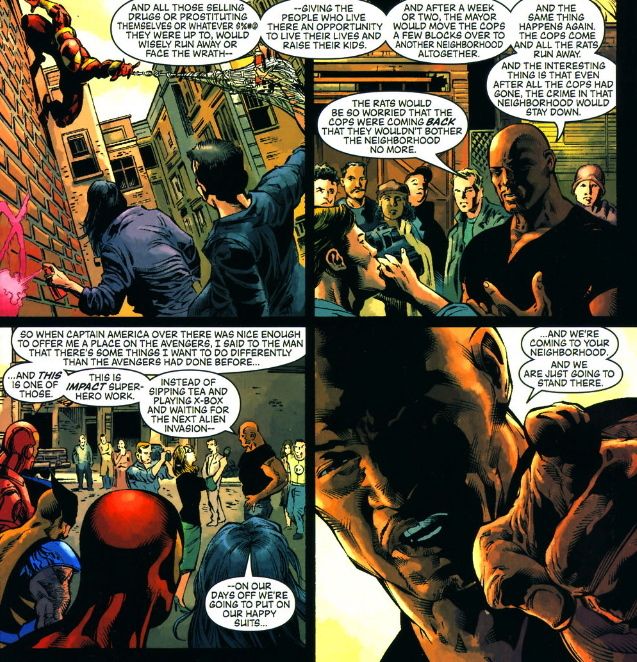 Real Dan Slott fans know that he did a similar thing with Spider-Man, after he lost his spidey-sense–having the character train with Shang Chi. 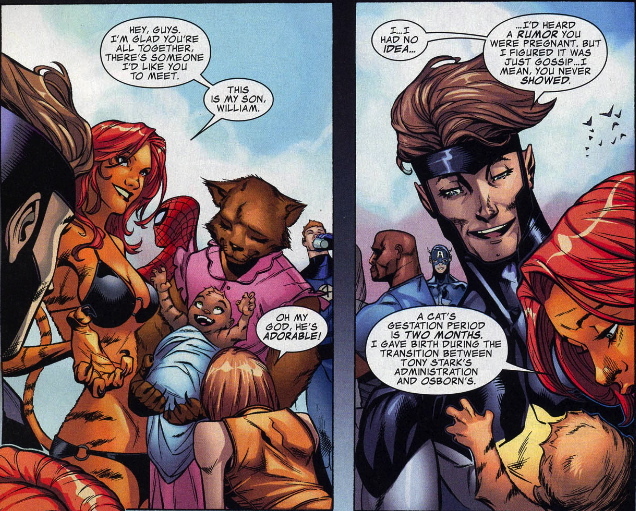 The book also gave us Tigra’s baby–a character that Marvel hasn’t done enough to develop. RIP to a great series. I don’t love Howard Chaykin’s art, but this shot is fabulous. 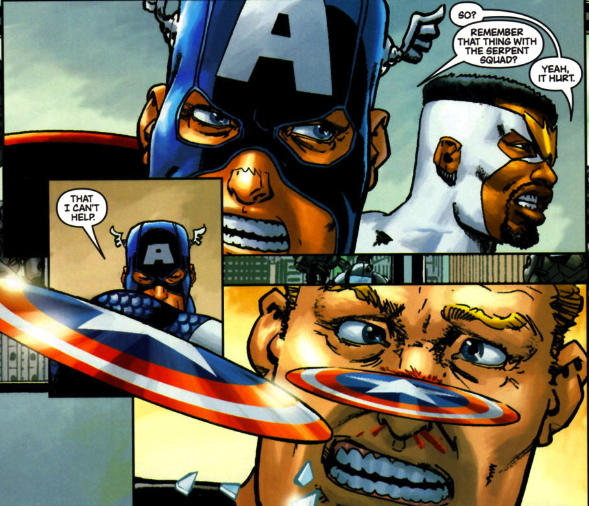 The Civil War is the end of my review of The Avengers. I know I promised to review every issue, but we’re coming close to the current period, and this is where “event fatigue” really begins to set in. 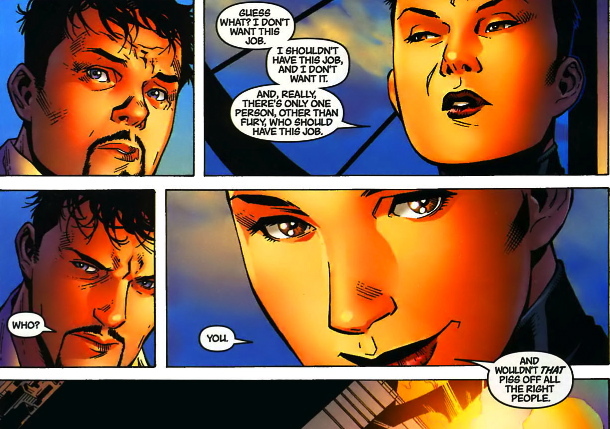 I don’t plan on stopping covering Fantastic Four, because it gets all the better when Jonathan Hickman comes on board–but this is where Avengers really peaked. Maybe in five or ten years, I’ll pick it up again–but after this, there was a sea of Avengers books. Some good, some bad, some bland…But the book never again got as good as it was before this. Yes, it did. I’m out. Thanks for reading, and stay tuned for a panel-per-issue examination of another great series! And so begins the Civil War, but not before tying it into World War Hulk. This is what makes Bendis such a great retconner–he weaves “actual” occurrences in with his new vision/version of the present/past. 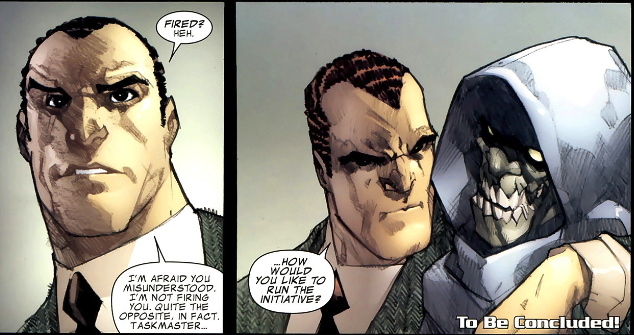 This sequence appeared in the middle of the Secret Invasion tie-in. 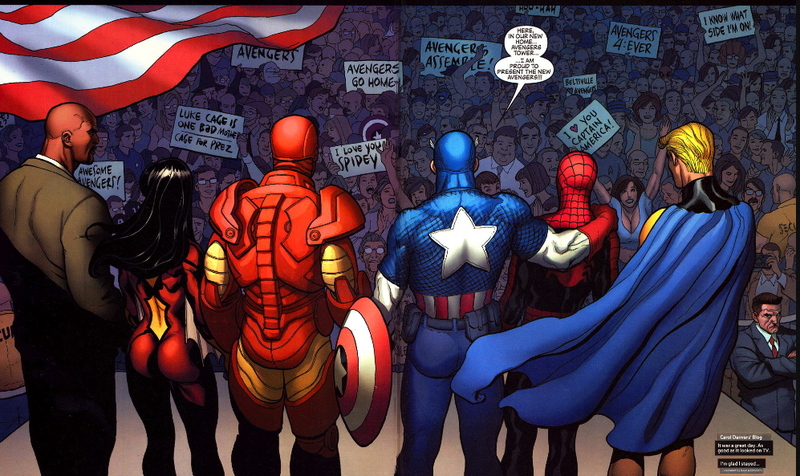 It was an interesting idea, but it got completely dropped as New Avengers went from this event straight into Civil War. 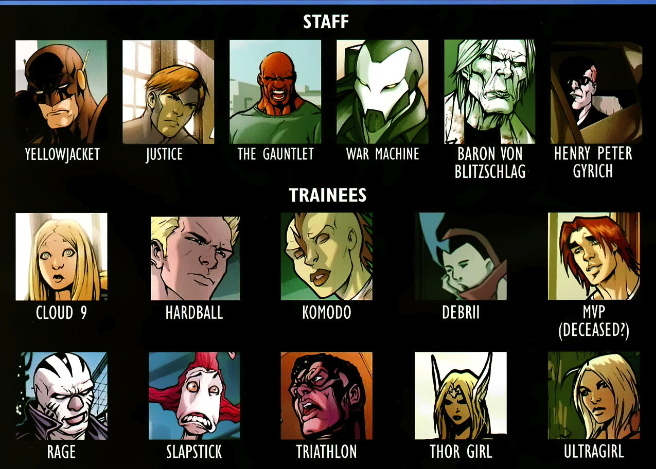 Love how Brian Michael Bendis takes the standard “new lineup” issue and only shows you them from the back. 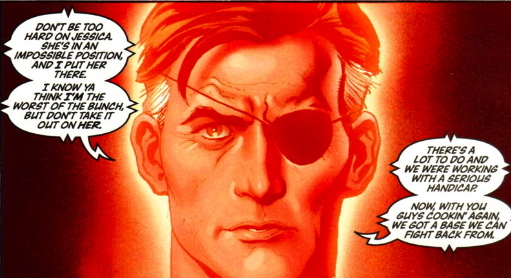 The return of Nick Fury, lookin’ kinda young. 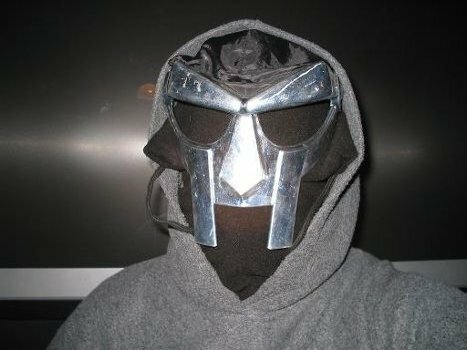 The first appearance of Ronin–the best Marvel character that never really was a character. 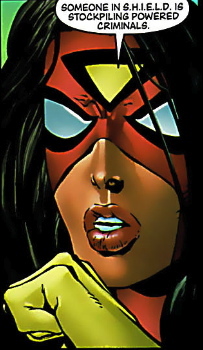 Brian Michael Bendis did not create The Sentry. I know that’s a shocker to many–especially since he’s the master of creating characters that you were “supposed to” have known about all along, but it’s true. 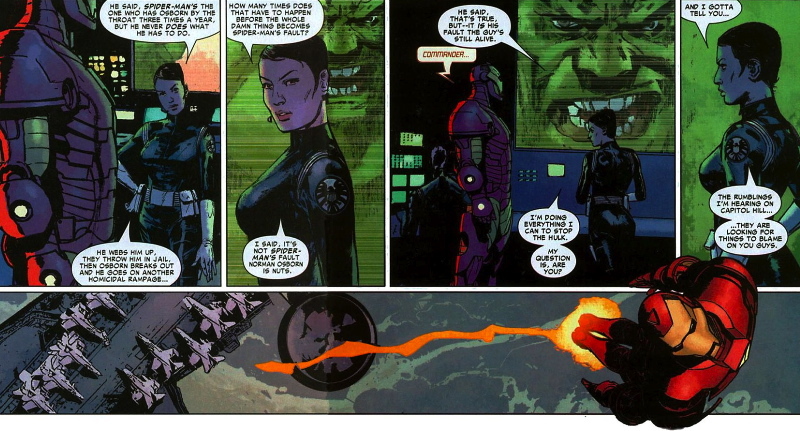 Sentry was created in 2000 by Paul Jenkins and Jae Lee in a Marvel Knights series that nobody cared about. First appearance of the Illuminati.